Life is too short, let have some fun. In our daily life, especially in school life, we pranked our friends. And now when we sit in our friends circle, we discuss those pranks and memories and just laugh. Now as things are evolved, we usually spend most of our free time on social media. We see many new posts, statuses and do chats too. Some of those posts make us happy and some make us sad. So to bring smiles on your face and the face of your friends and family members, we developed a very easy and fast Instagram post simulator. Which you can use and make some funny posts to bring smiles and bag some gags. Generate Fake Instagram Post and prank your friends by sharing the generated image. Upload profile picture , Make a screen-shot as you like with our tool and astonish your friends. Use our Fake Instagram Post Generator Online & Simulator and prank your friend on all social media platforms. Its easy to use and very simple, but having latest Instagram layout and design as well as icons and buttons. You can also generate fake Instagram comments by our fake Instagram comments generator. 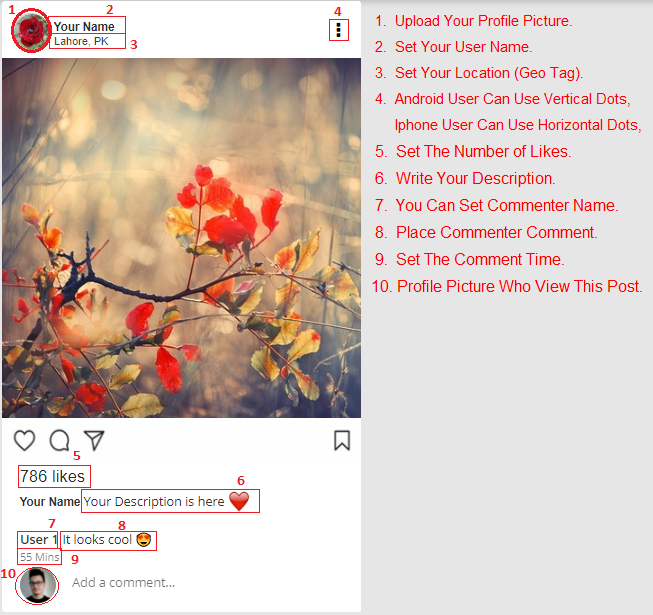 How to generate fake instagram post? Wow! Finally I got a blog from where I can genuinely generate real Instagram post. How can i build fake comments? Please visit https://zeoob.com/generate-instagram-post/, you can add as many comments as you want. Great tool, really loved it. let you know. The design look great though! Hope you get the problem solved soon. Your tool is good, i see its updated. Please update its tutorial too. this onto a colleagսe who was conducting a little homework on this. Hi there! Such a wonderful site, thank you! Can you inform me how to download post as png format? Good tools. I will be experiencing some of these as well..
Ι’m pretty pleased to find this web site. I need to to thank you. Bad can’t download image. Anybody can help me? I’m really enjoying your fake generator tool. Is it using latest Instagram version? Its amazing, looks exactly like Instagram post. Pretty! This was an incredibly wonderful generator. is reputed and offers the most effective tools and generators. Loved it. First of all I would like to say its awesome tool! of it and I have you book-marked to check out new things on your website. Hiya, I am really glad I have found this tool. Really loved this. Hmm is anyone else encountering problems with the pictures on this loading? I’m trying to determine if its a problem on my end or if it’s the site. Ԍreat site. Lucky me I discovered your blog by chance (stumbleupօn). Hence a punter must be sure how the site that they can generate insta posts from instagram template. Hey i have complement, its the best generator which i ever used.